I'm using Windows 10 Pro x64 Version 1703.
can you start an elevated command prompt, type in wmic and hit Enter. what is in the Adapter RAM field? I have the same issue, but with a Quadro P4000 video card. 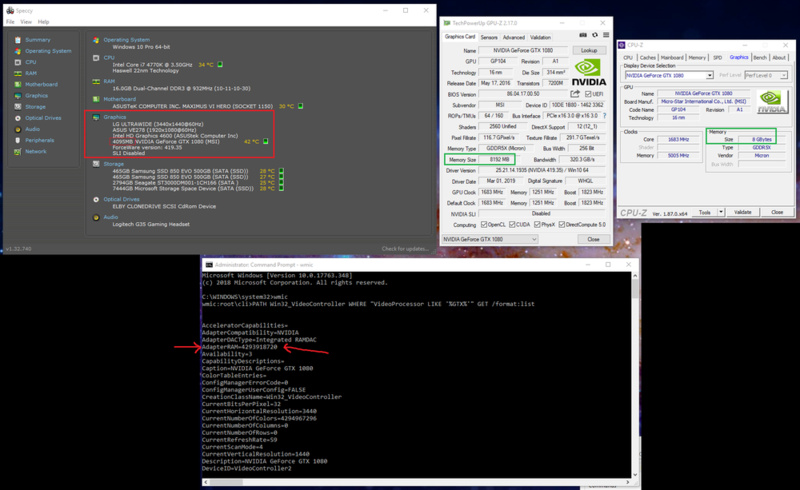 Both the Quadro and GTX 1080 EXOC are NVIDIA cards, are Pascal-based, and have the GP104 GPU. Maybe Speccy will be updated to have these GPUs or the Pascal architecture included in its database (or in whatever place such information would need to be) sometime? Like chorabr, I use Windows 10 Pro x64, v. 1703. The entry above you suggested for chorabr PATH gives me a "No instance(s) Available" result, but I'm guessing it's because the entry is for the 1080 card. I tried it anyway just to see what I'd get. it relies on the string "GTX" being in the firmware field VideoProcessor so perhaps it's not. check the AdapterRAM field (and out of curiosity, let me know what was in the VideoProcessor field). Other programs/applications I've used (e.g., HWiNFO, GPU-Z) report the 8GB of RAM on the card. sorry, no ideas as to why Speccy isn't showing the actual RAM, although it does seem to be correctly showing the RAM that is being passed through WMI. the Devs to see these posts but won't chime in unless more info is needed or some test required. A slight bit of thread mining, but I'm running a Nvidia Quadro K5200 (8gb GPU) and Speccy also says it's only 4gb. A bit late to the party, but I have the same issue, GTX 1080 shows 8 GB in GPU-Z but shows 4 GB in Speccy. Here's a screenshot. @mta my return value for that command (including GTX) has for AdapterRAM "4293918720" (wait, if I divide enough by 1024, that's 4095, same as Speccy). My VideoProcessor is indeed "GeForce GTX 1080". Why are both of these off from not only GPU-Z (and CPU-Z), but also from the manufacturer who clearly wouldn't ship the product with half the RAM hoping no one would notice, I mean unless I'm the first person to notice. yeah, sorry, can't explain that. so it actually has 8GB, two separate programs support that. but at least Speccy is really only passing on what it's finding out for itself. if Speccy is using that AdapterRAM field, then it's obviously either the wrong field or some multiplier needs to be factored in based on some other info Speccy is missing.